It was a cold and windy week at Stowe Mountain. My smug celebration of triumph over my anxiety demons vanished with the lack of sun, the bitter cold, and the icy trails. The smart decision, for me, would have been to accept that conditions were not good, for me, and to settle down with my book: Cyndi Lee’s May I Be Happy. But it was too early in the vacation week to “give in” to a day off. And so I fought the conditions, determined to have a magical week. Our skiing abilities have converged at that happy and temporary moment where we all can ski together. I wanted to enjoy this week together. And so I did. I ski because my husband skis. We met on a group cross-country long weekend, 20 years ago this February. I tease him that it was false advertising, because he is a downhill skier not a cross-country skier. I had my one and only certifiable full-blown classic panic attack when attempting downhill skiing earlier with a former boyfriend. Of course, I had much to be anxious about as we navigated the fork in the road in our relationship about whether or not to marry. After sweating, hyperventilating, and resisting the urge to throw up, I decided that downhill skiing was not for me – and I decided not to marry that boyfriend. I came to more adventurous sports, like cycling and hiking in my 20’s. I was not brought up with much exposure to athletics and team sports. I was one of the last girls picked for the softball team. I discovered physical activity through ballet and loved having a strong and active body. But skiing was forbidden to ballet dancers, deemed to be too risky. These adventurous activities were so foreign to how I was raised, that I really got a charge out of the challenge of pushing myself physically. Skiing, however, added a whole new layer of anxiety and discomfort. I fell head over heels in love with my husband at first sight. In my attempt to impress him, I agreed to go downhill skiing instead of cross-country skiing that weekend and fell and hurt my knee. When we returned from the weekend, he checked on how I was doing post-ski-injury and we began dating. We had a joyful and passionate courtship and married a year later. Part of a loving relationship is sharing interests with the other person and doing things that make the other person happy. I had spent years learning what I was interested in and was very insecure and suspicious about giving up my Self to take on another person’s interests. This time it felt different. Somehow it was okay to do things because he wanted to do them. I learned to ski. Learning to ski is an enormous challenge, especially as an adult. It is a scary and uncomfortable activity that requires travelling, carrying equipment, and enduring a variety of less-than-ideal conditions. For the first few years of our life together, it was difficult to actually ski together because our levels of ability were so different. I took a lot of classes with other adults at my level. I was very good in these classes, eager to please the teacher and work towards progressing to the next level. Then I would ski with my husband and all my eager enthusiasm would dissipate. I became passive aggressive, going extra slow on trails that should have been easy but I wanted to make sure he knew they were HARD for me. I would stand at the top of a steep section and my heart would race and my stomach would lurch and I would exclaim that I couldn’t do it! Somehow, for the most part, he patiently coached me or ignored my save-me-I’m-a-victim theatrics and we built a skiing life together. It helped that there would be magical days when I wasn’t too cold and nothing hurt and I felt confident and skiing was actually exhilarating. I never gave up on skiing – feeling compelled to prove I could do it; feeling compelled to make him proud of me; and feeling compelled to achieve it because it was such a crazy different achievement from all the intellectual pursuits I had been directed towards by my parents. We introduced our children to skiing at as young an age as possible and have been skiing as a family for 10 years. My skiing, our skiing, has changed over the years. In the early years, it was a lot of work to manage their equipment and our equipment and get them to ski school on time. My daughter, an obedient first-born girl, unquestioningly and energetically went off to ski school every year and has become a beautiful and technically proficient expert skier. My son, never one to separate easily, resisted spending the day away from us in ski school. We insisted and he has also become an excellent skier, though I see elements of my anxiety and passive-aggressiveness in him. I also see how he enjoys the thrill and the challenge when he skis in the woods and the terrain park. My husband has become a more patient skier, willing to take breaks and ski less advanced terrain. And I have lost my anxiety – most of the time. It still lurches up when I am cold or the wind is blowing and I can’t see well. But when the sun is shining, I love skiing. I never thought I would say that or feel that. It took 20 years – and I really only feel the joy when the sun is shining. I use all my yoga on our ski trips. I remind myself that nothing is permanent and that the bitter cold chairlift ride will not last. I remind myself that my anxiety is a bad habit that I can change, have changed. I remind myself to breathe and to change the tape in my head to something more positive. I remind myself that I have nothing to prove and that my reason to ski is to have fun with my family. I remind myself to be grateful for the happy moments, patient with the uncomfortable moments and compassionate with the different moods that swirl in close quarters. I have such sympathy for the children and the parents snapping at each other as they struggle off to ski school, such sympathy for the woman at the top of a steep section yelling at her partner that she can’t do it or frozen with panic, such sympathy for the woman who says I am going to go to the spa. With only one or two exceptions, we’ve spent every annual family ski week at Stowe. 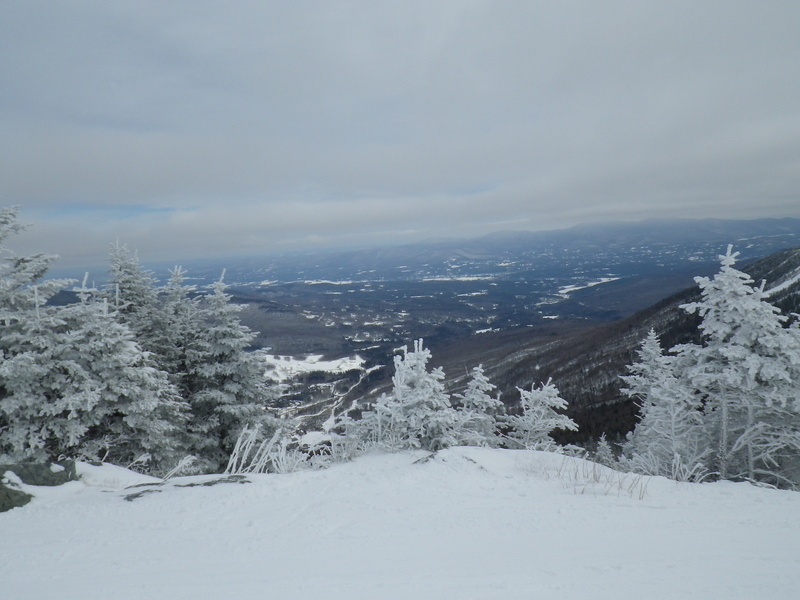 Just as our family skiing experience has evolved over the last 10 years, so has Stowe. Stowe has always had an active town with many shops and restaurants and plenty to do for non-skiers year round. Like all ski towns, though, it welcomed a rugged attitude: “I’m just here for the skiing! I’ll ski anytime, anywhere, with any conditions!” Toughness was embraced. It took several years but the new resort at Spruce Mountain, the Stowe Mountain Lodge, has changed the tenor of the town and the skiing experience. I wonder what locals think? The new resort is beautiful, very expensive, and adds a level of luxury and comfort that didn’t use to be at Stowe. The older resorts seem faded, as if they can’t grasp how to compete or to respond to the new type of person visiting Stowe. Most of our vacations have been spent at the Golden Eagle Resort, a mid-priced resort with not a lot of luxury. It is familiar, but very dated and awkwardly large and spread out. Tired aura. At The Firefox Inn for a basic Italian dinner, we were shocked at the drab décor and the ungracious service. Bad aura. Frida’s Taqueria is crowded and doing a good business. The food is authentic and the service is friendly. Good aura. West Branch Yoga exuded yoga. When we walked in, we looked at each other and smiled. It smelled like yoga. We were welcomed generously. Warm aura. As for the luxury resort at Spruce, it is not my favorite place. It is well-designed and convenient, but very expensive and haughty, with closed off sections “for members only.” The guests there seem self-absorbed and in their ivory tower. Narcissistic aura. (Full disclosure – if I could afford it – I would probably stay there.) I feel for the town and the older establishments as they face this junction in their business. The more frugal die-hard skier still exists but the money to support the businesses will come from the affluent visitors. I’m looking forward to heated seats on the chairlifts. Surely that will be the next upgrade. Friday, our last day, was the warmest day – though still no sun – and we were all eager for a good day after all the cold days before. Rested from a day at the spa, I was ready to feel the exhilaration and to conquer the mountain. We tackled Lift Line, a double black diamond trail, a rare event in my skiing repertoire. My son wanted to say he did a double black run and my husband wanted to get it in before his knees failed him and I didn’t want to be left behind. As we headed for the run, the anticipation of anxiety got the better of me. Just making the commitment to do the run made my heart race. It’s a nerve-wracking chute down to the top of the first drop off. I got there and giddily sang: “Hello Terror, My Old Friend” and made the mistake of stopping instead of just jumping in. Frozen, I had to talk myself out of panic. Once I jumped in, the run was fine. My son was so excited to have done it. He too conquered his anxiety. We enjoyed every moment of the day. Perhaps it was our last in Stowe. What will our skiing life together be like when my daughter goes to college? Is it time to give Stowe a break? Finally, on the last run of the day, the sun tried to break through and we found a faint rainbow in the sky. Magical. Good-bye for now Stowe. Thank you for some wonderful family moments and memories.